Agriculture and Ecology Student Activity Trail – now open! We have developed an on-site science activity for elementary students (grades 2 through 5) based on KBS LTER research. With guidance from a trained KBS volunteer, an interactive activity booklet leads students through a 1-mile nature trail at the W.K. Kellogg Bird Sanctuary, teaching them about agriculture, ecology, and the scientific method. Each of the 15 lessons meets Michigan’s teaching standards. Based on teacher input, we created an accompanying teacher’s guide with background information and additional activities for the classroom. The trail is open April 15 through November 1. To use the trail, classes MUST be accompanied by a trained KBS volunteer. Visit the Kellogg Bird Sanctuary’s website to schedule a field trip and find more information on group tours. For more than 12 years, we have hosted a long-term partnership among area science teachers, LTER scientists, and College of Education faculty to enhance the content and delivery of the Michigan K-12 science curriculum. 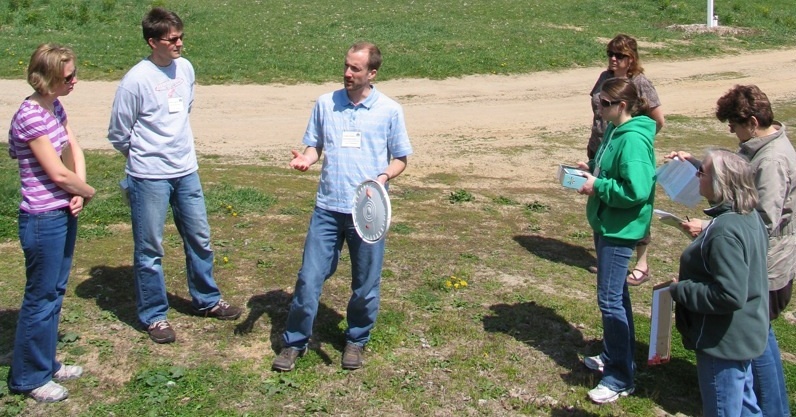 The program promotes improved science teaching by providing teachers in-depth exposure to current topics in ecology together with training in inquiry-based science methods. For more information about this Partnership program, including access to K-12 science curriculum, please visit the Kellogg Biological Website. Data Nuggets are free activities that give K-12 and undergraduate students practice interpreting quantitative information and making claims based on evidence. Each activity contains real data from cutting-edge research, and features the true stories of KBS LTER and other scientists. To access Data Nuggets, click here, and for a list of activities using LTER data, click here.